Sally M. Eginton passed away March 31, 2019 at home with her family, and in the care of Hospice of the Red River Valley. Sally (Sal) M. Eginton was born to William and Isabel (May) Smith and raised in St. Paul, MN. She attended college at the U of M, taught dance at Arthur Murray school of dance and volunteered at the Children's hospital. On October 24th,1963 she married Charles (Doc) T. Eginton M.D. The couple raised their family in Fargo, ND and Detroit Lakes, MN, where she was an active mom who helped her three children engage in Cub Scouts, Boy Scouts, hockey, dance, and Campfire Girls. Sal loved to vacation annually at their beach home in Bonita Beach, FL, where extended family and friends were always welcome. No matter where she was, fun and beautiful memories were forever forged. She began bartending in the mid-70's at the Broken Wheel in Detroit Lakes and other establishments including the Holiday Inn, the Elks Lodge, Sandbar, and Shorewood Pub. Also in the ‘70's and 80's, she promoted music by booking bands at local bars and larger concert venues, including Leon Russell, the Little River Band, and Scarlett Rivera to name a few. Sal loved her family, friends, birthdays, holidays (especially Christmas), hosting picnics and parties, music, traveling, and last but not least, gambling. She enjoyed water skiing, downhill skiing, riding her motorcycle, and snowmobiling with her friends. She also played league softball, volleyball, pool, and darts. 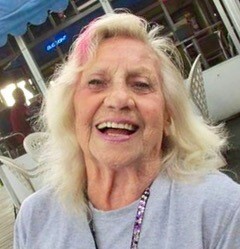 She was an avid football and Nascar fan. She had an amazing zest for life, travel, adventures, and was generous with her love to family and friends. To sum her up in a couple paragraphs is impossible. Her family and friends will miss her for all these qualities and more. Sal is survived by two brothers Randy (Diana) Smith, Atwater, MN and Tyler (Judy Ann) Smith, Stillwater, MN; three children Bill (Rachel) Eginton, North Little Rock, Arkansas, Julie Eginton-Cogger of Callaway, MN, Mark (Joleen) Eginton, Duluth, MN; Six grandchildren Flora (Charles) Larrabee, Sean (Jessica) Cogger, Steve and Sally Cogger, Charles and Isabel Eginton. Five great-grandchildren; Owen, Sadie, Maggie, and Zoey Cogger; Lillian Larrabee (due in June); one niece, five nephews. Her dog Willow who she loved dearly. All are welcome to join the family to Celebrate Sal’s life at the Shorewood pub Saturday April 27, 2019. Bring your guitar, harmonica, tambourine, songs, or stories to share. There's still time to send flowers to the Celebration of Life at the Shorewood Pub from 2:00 PM to 5:00 PM on April 27, 2019.